Published on the occasion of the first exhibition of his paintings at Mitchell-Innes & Nash, this fully-illustrated catalogue features an essay by art historian Paul Hayes Tucker. 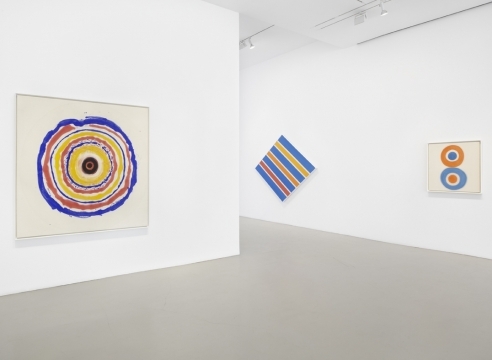 The exhibition, “Kenneth Noland: Paintings, 1958-1968,” features major paintings dating from the artist’s first decade of mature work. It includes significant early examples of the circle, stripe and chevron compositions that became Noland’s signature forms throughout his career. Kenneth Noland (1924-2010) is among the most influential Post-War abstract artists and one of the central figures of Color Field painting. His unprimed canvases with geometric forms painted in thin washes of pure, saturated color forged a new direction in abstract art. This exhibition and extensive catalogue presents new insight into the artist’s life, his influences, and the impact American popular culture had on his art and vice-versa.